12.10.2018 Mexico City Workshop on brass acoustics at Facultad de Música UNAM, 12 - 2pm. 17.07.20188 Darmstadt Instrumental Music by Eliane Radigue at Darmstädter Ferienkurse in quartet with Dafne Vincent-Sandoval, Charles Curtis and Rhodri Davies. 03.07.2018 Berlin Zinc & Copper Wired at Acud Macht Neu. Supported by the initiative neue musik berlin e.V. 16.12.2017 Berlin Performance of Borromean Rings and Stefan Bartling&apos;s Canopy Gap with Reidemeister Move at Haus Kunst-Mitte, Heidestraße 54, 10557 Berlin. Concert starts at 5pm. Free entry. 23.11.2017 Berlin Performances at Mitya Trotzky&apos;s Fugitive Souls within Itinerant Interludes series, Kunstverein am Rosa, Linienstraße 40, 10119 Berlin. 01.06.2017 Montreal Simon Martin&apos;s Musique d’art pour cor, trombone, tuba et électronique with Zinc & Copper, at Le Vivier. The concert starts at 8pm. With financial support from the Goethe Insitut. 30.05.2017 Montreal Workshop Well Tuned Brass with Zinc & Copper, at Le Vivier, Espace Cousteau. The workshop starts at 3pm and lasts 60 minutes. With financial support from the Goethe Insitut. 04.05.2017 Mexico City Microtub amplified at in TonalAtonal concert series at Caso del lago, 8pm. 03.05.2017 Mexico City Microtub in TonalAtonal concert series at Ex Teresa, 7.30pm. 02.05.2017 Metepec, Mexico Microtub at Museo del Barro, Sala de escucha, 7pm. 01.05.2017 Morelia, Mexico Microtub at Comite de Asuntas Intangibles. 18.10.2016 Milan Zinc & Copper at "O"
07.07.2016 Berlin Introductory workshop on Hayward Tuning Vine software at Weincafe W.
16.06.2016 Berlin Tuning Wine session with Audrey Chen at Weincafe W.
05.11.2015 Berlin Splitter Orchester in collaboration with George Lewis. World premiere of George Lewis&apos;s Creative Construction Set TM. Haus der Berliner Festspiele, concert starts at 7pm. 25.10.2015 Berlin ZINC & COPPER play BRASS MAQAM. Amir ElSaffar - trumpet, Robin Hayward - microtonal tuba, Hilary Jeffery - trombone, Elena Kakaliagou - french horn, Paul Schwingenschloegl - flugel horn. Paul Gerhardt Kirche, Hauptstrasse 47 - 48, 10827 BERLIN Schoeneberg. Concert begins at 8.30pm. 15.10.2015 Sydney, Australia Duo with Laura Altman at Hibernian House, 342 Elisabeth Street, Sydney. Starts 7pm. 30.08.2015 Berlin Talk on Stop Time in podium discussion at Translating Music festival. Talk begins at 15:55 at Ballhaus Ost, Pappelallee 15, 10437 Berlin, 4th floor. Admission free. 28.08.2015 Berlin Participation in Translating Music festival. 17.04.2015 Berlin Trio with Philipp Gerschlauer (saxophone) and Nicola Hein (guitar) at Altes Finanzamt, Schoenstedtstrasse 7, 12043 Berlin. Concert starts at 8pm. 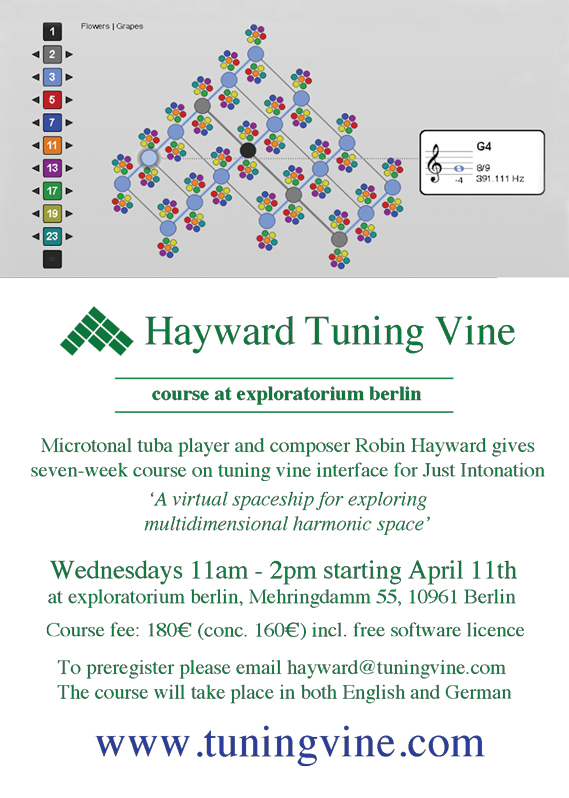 11.10.2014 Berlin Hayward Tuning Vine workshop at N.K. 30.10.2011 Berlin Borromean Rings with Reidemeister Move plus premiere of new piece by Christopher Williams at the Evangelische Bruedergemeinde Berlin, Kirchgasse 14-17, 12043 Berlin Neukoelln. 08.10.2010 Berlin CD release of States of Rushing at N.K. 07.03.2009 London premiere by Samuel Stoll of Handwork for microtonal horn. Riverhouse arts centre, Walton on Thames, UK, KT12 2PF, 8pm. Ten experimental sound artists are invited to explore in public the principles of self-cancellation in sound through conferencing, workshops and performance in London and Glasgow. 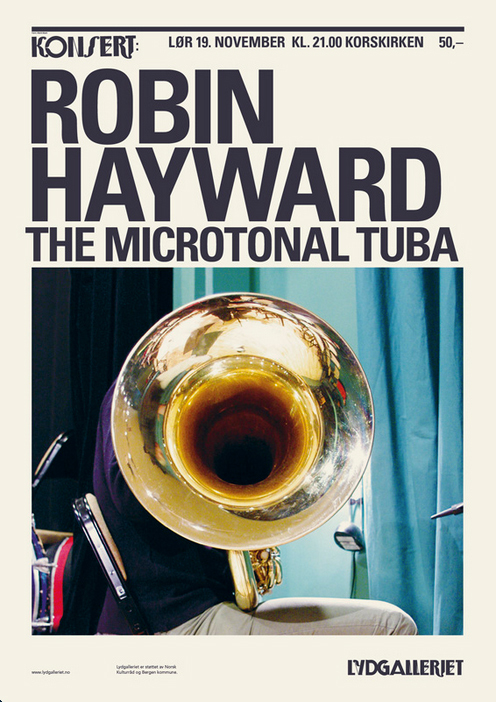 Hayward will be performing a new solo piece during in the tuba is muted with sand, as well as in a new piece by Rhodri Davies. A collaborative project curated by Davies and the artist Gustav Metzger. Invitees includes Ben Drew, John Butcher, Lee Patterson, Mark & John Bain and Sarah Washington.